I’m a golden girl. It’s not that I don’t like silver (love it as hardware on handbags! ), but I just tend to gravitate towards gold! You also have probably noticed I like to keep my jewelry simple. Every once in awhile I’ll pull out a pretty pair of statement earrings, but most days (and nights) you’ll find me in light, dainty pieces like these rings from Gorjana. As a longtime customer and fan of the brand, I’ve acquired many Gorjana pieces over the years. 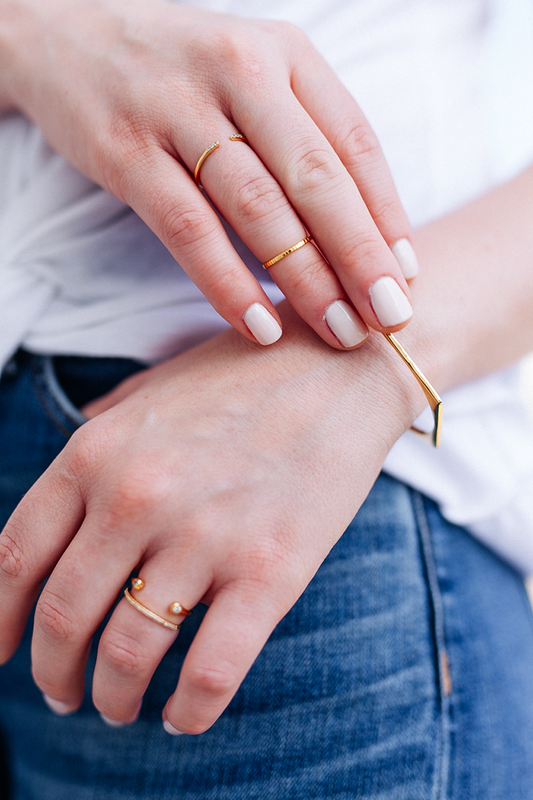 A few of my current favorites (and classics) include this shimmer bar ring, the Aurora necklace, this delicate chain ring, and the Teagan cuff. Since they look good with everything, I wear them constantly! 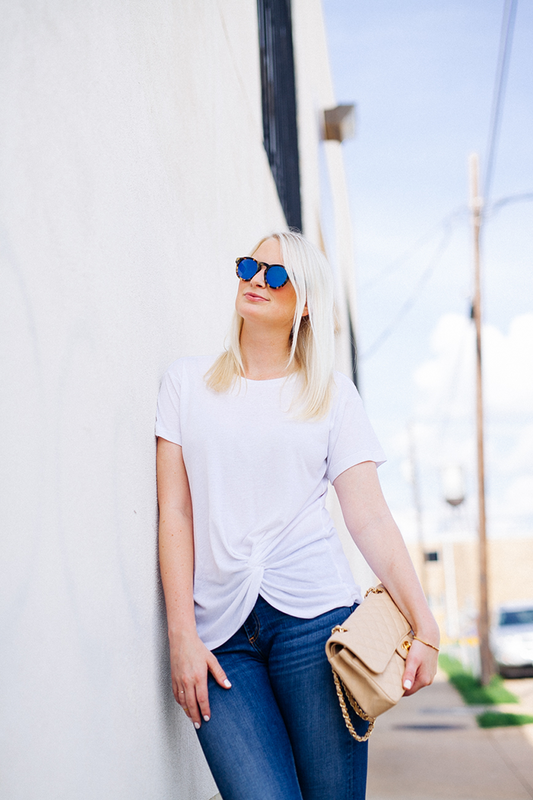 PS – don’t forget to check out Nordstrom’s sale section! I recently picked up this sweater (I LOVE IT – will be perfect for traveling this fall), but now I have a few other items in my cart including this frayed tweed jacket, this bright white eyelet dress and these embellished flat sandals. 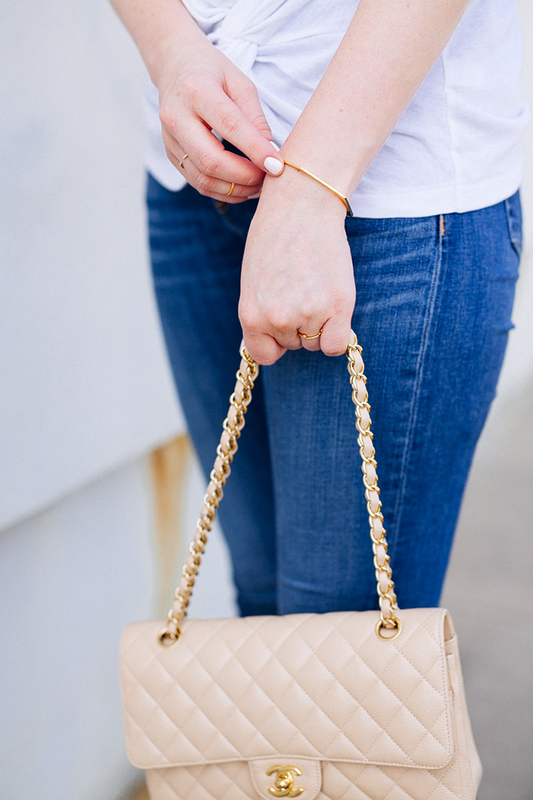 I love a simple, casual outfit and you nailed it with this one! The detailing of the tee is perfection. 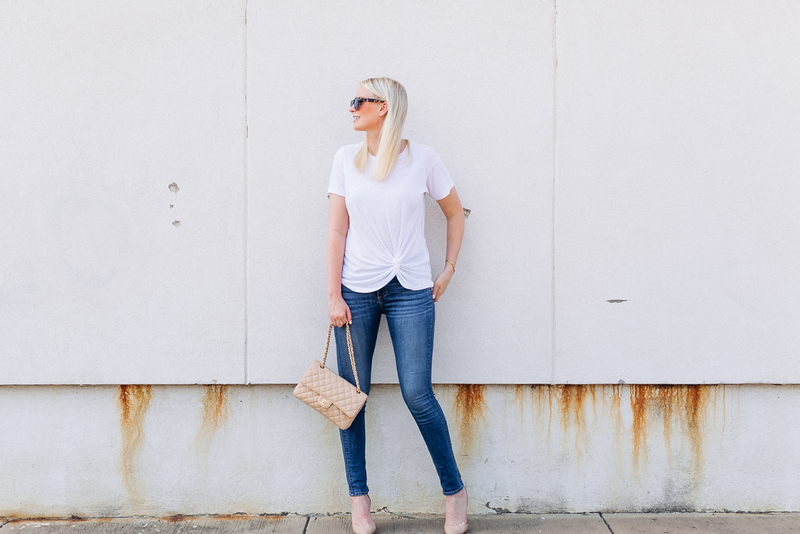 I love a classic white tee and jeans. It’s timeless and universally flattering. 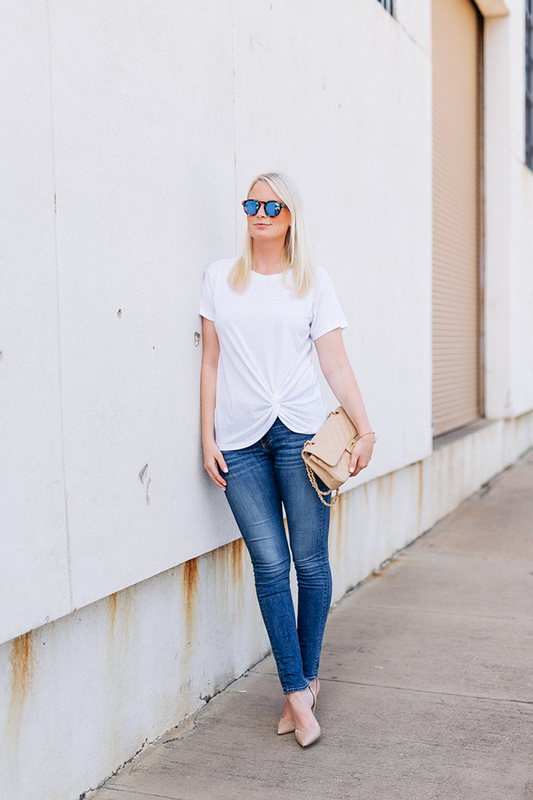 Loving the knotted tee and those jeans are perfect on you! Gold looks so good on you! LOVE that tee! The front detail is so cute. And I’m with you – definitely a golden girl!! 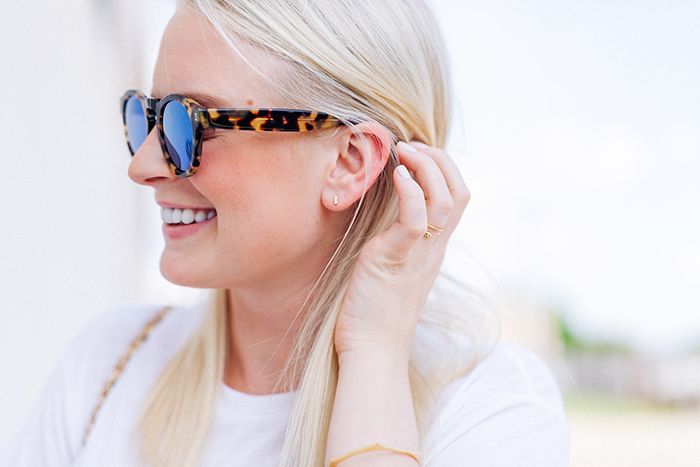 I love the dainty gold jewels you’ve chosen – great white tshirt too! Love the gold rings! Also, that shirt is adorable! 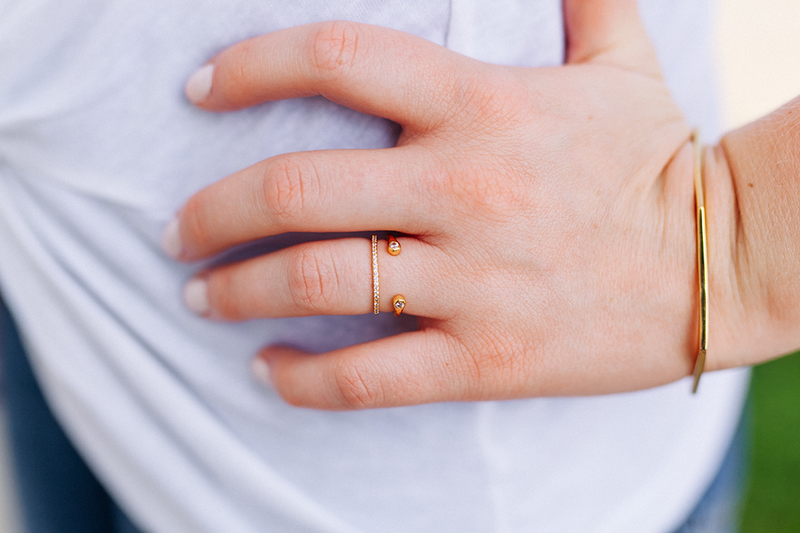 I love the delicate little midi rings, it’s definitely a nice touch! Totally loving those glasses on you! I’m the same way when it comes to gold…I’m more attracted to it than silver. Love this casual look on you.